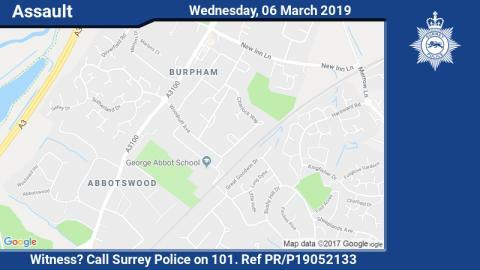 The 15-year-old boy who was arrested yesterday (6 March), following the assault at George Abbot School in Guildford has been released on bail. Officers were called to the school in Woodruff Avenue around 1.45pm following reports that the boy had assaulted another pupil with a pair of scissors. Members of staff intervened immediately and remained with the suspect until officers arrived. The 14-year-old victim suffered a single small puncture wound to his back and was taken to hospital but has since been discharged. Guildford Borough Commander Inspector Andy Hill said: “This was an isolated incident between two pupils at the school. Staff were on the scene immediately, intervened and remained with the boy until we arrived. “I would like to reassure parents that no other pupils were involved in this incident and there was never any risk to the wider public.